Happy to be participating today at the Marshes in a special tournament where I'll get to play golf with two talented Junior golfers, Pauline Roussin-Bouchard from France and Hana Ryskova from the Czech Republic. The 60 talented athletes from 19 Countries will begin there competitive rounds tomorrow at the Marshes. Come and check some great Junior golf all week as its free and the Marshes is a great venue to watch golf. OTTAWA – A well-accomplished field of competitors will take to The Marshes Golf Club from Sept. 24-29 for the fourth annual World Junior Girls Championship. In total, 60 athletes will represent 19 countries – including two teams from host nation Canada. This year’s field is highlighted by 11 competitors ranked inside the World Golf Amateur Rankings (WAGR) top 100. Among them are the tournament’s top two ranked players from Sweden: Amanda Linnér (No. 18) and Beatrice Wallin (No. 38). The pair will be joined by teammate Linn Grant (No. 84) — who was a member of the silver (2014) and bronze (2015) World Junior Girls Championship team medal winners. Both Linnér and Grant will make their second appearances at the championship. 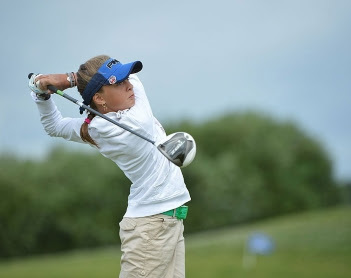 In 2017, Linnér captured the ANNIKA Invitational Europe and France International U21 (Esmond Trophy), while also placing second at the ANNIKA Invitational USA. Wallin earned a second place finish at the France International U21 (Esmond Trophy) and Grant picked up wins at the Helen Holm Scottish Open Stroke Play Championship and German Girls Open. The 2017 installment of the event will see numerous players return as 18 members of the field have played in at least one World Junior Girls Championship, including both the 2016 silver medallist Jennifer Chang (USA) and bronze medallist Caterina Don (Italy), who look to become the first repeat medallists in tournament history. Led by the 91st ranked Chang, the American team will aim for another strong performance following last year’s third place result. Team USA will also feature 2017 U.S. Girls Champion Erica Shepherd (No. 162) and Gina Kim (No. 75). While the Italian team does boast the defending individual bronze medallist, it could be another member who steals the show. Alessia Nobilio, who participated in the 2016 World Junior Girls Championship, comes into the tournament as the third-highest ranked player at No. 41 after a 2017 season that saw her win the International Juniors of Belgium and France International - Cecile de Rothschild Trophy. In addition, she and teammate Caterina Don (No. 127), won the Italian U18 Team Championship. Don also picked up individual honours with a win at the Italian Girls U18 National Championship. The two World Junior Girls Championship veterans will be joined by newcomer Alessandra Fanali, who currently ranks 112th in the WAGR. In 2016, the Philippines captured the title by a nine-stroke margin on the strength of gold medallist Yuka Saso, who was the lone player to finish the tournament under par. This year, the defending champions will be paced by Harmie Nicole Constantino (No. 305), who won the Philippine Amateur Open. She will be joined by teammates Junia Louise Gabasa and Kristine Torrabla. With all of the returning teams and players, the World Junior Girls Championship is also pleased to welcome two teams that will be making their debut in 2017, Chinese Taipei and Switzerland. Chinese Taipei will send Kuan-Yu Lin (No. 1096), Hui-Wen Chiu (No. 943) and Jo-Hua Hung (No. 379). The Swiss will feature Victoria Monod (No. 612), Elena Moosmann (No. 85) and Chiara Tamburlini (No. 376). The strong international field will join the six players chosen to represent Canada. Monet Chun (Richmond Hill, Ont. ), Ellie Szeryk (London, Ont.) and Céleste Dao (Notre-Dame Ile Perrot, Que.) will form Canada One, while Alyssa DiMarcantonio (Maple, Ont. ), Euna Han (Coquitlam, B.C.) and Emily Zhu (Richmond Hill, Ont.) will make up Canada Two. In addition to the four-round, 72-hole team and individual event, the World Junior Girls Championship will celebrate the game of golf and promote the development of junior girls golf. There will be a PGA of Canada coaching summit and Future Champions Clinic on Sept. 24. The opening ceremonies take place on Sept. 25 before the first round of competition on Sept. 26. Closing ceremonies will take place on Sept. 29 immediately following play. Admission to the competition is free. Additional information regarding the fourth annual World Junior Girls Championship can be found on the competition’s website.